Canada Silent No More needs Testimonies. URGENT: We are collecting testimony declarations from women who have been hurt or damaged physically, emotionally or who got breast cancer, cervical damage, had a subsequent pre-term birth, infertility, suffered depression, turned to alcohol and drugs, had suicidal thoughts or attempts etc? We want to hear from you. We are looking for brave and courageous women to testify to the Supreme Court of Canada on how legal abortion has hurt them. You are not alone. If you know any former abortion patients, please have them message me, k. Also we need pro life groups to distribute our declaration forms...the US has over 5,000, we would like to get at least 500. We have over 100 declarations so far. Thank you so much for your prayers and support!! God bless you! Plus a link to Denise Mountenay's Facebook page, where she says she is the "Founder/President" of Canada Silent No More. 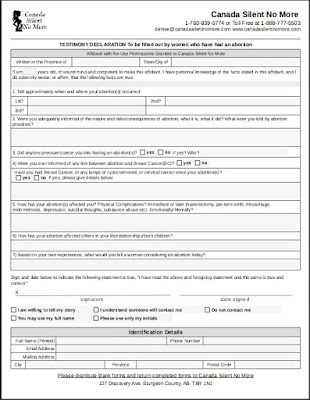 And a link to a pdf form to fill out. 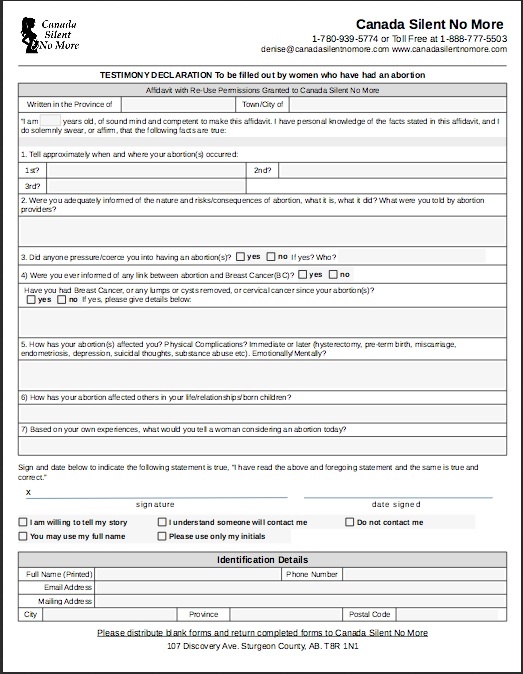 The form is titled "Testimony Declaration" and stipulates that it is to be filled out by women who have had an abortion. It asks for age, dates(s) and location(s) of abortion(s), whether the testifier (is that a word?) was adequately informed of the risks of abortion, whether she was coerced into it/them. Then there's this: "Were you ever informed of any link between abortion and Breast Cancer (BC)?" (yes, capitalized) with yes/no boxes to tick. Follow-up question: "Have you had Breast Cancer, or any lumps or cysts removed, or cervical cancer since your abortion(s)?" Yes/no boxes, with request to give details. Then three more questions on Physical Complications (yes, capitalized again), "depression, suicidal thoughts, substance abuse, etc." Some space to give details. Signature/date lines, some boxes to tick about whether the person is willing to let her name be used etc., then an identification section asking for full name, email and mailing address, phone number. If this were a poll, which it is in a way, it would be called a "push poll." I don't think I need to remind DJ! readers that THERE IS NO LINK BETWEEN ABORTION AND BREAST CANCER. But I had never seen abortion connected with cervical cancer before and googling "abortion cervical cancer" returns only fetus freak sites. Further inspection of the Canada Silent No More site reveals a "testimonies" section, which is three pages of snippets of stories with links to their continuation, oddly, all posted on January 26, 2016. There is no mention anywhere on the site that I could find of the Supreme Court of Canada and I feel pretty confident in saying that if there were an abortion case coming up before the SCC, I'd know about it. So WTF is this about? Who is Denise Mountebank, er, Mountenay, and why is she collecting this information? Why is she leading people to believe they will have a chance to "testify" about their abortions to the Supreme Court? And while we're asking questions: What *is* Canada Silent No More? There already is a Silent No More organization with a Canadian chapter. Angelina Steenstra is National Coordinator for Canada. Canada Silent No More is a separate organization and is not affiliated with Silent No More Awareness Campaign Canada. After all, there is room for just so many *inspirational* "I had an abortion boohooooo" speakers in the market. Will both organizations make an appearance at the upcoming Futility Fest on the Hill? Will unpleasantness ensue? Angelina: I'm Silent No More! Denise: No! I'm Silent No More! Angelina: I'm More Silenter No More than you are! Denise: I'm the Most Silent No More! How do you expect to get that 'evidence' before an appellate court, the highest appellate court in Canada? It is not a court of first instance for receiving and testing evidence. It is an appellate court, not a trial court. I understand the point of that evidence but it has to be brought before a trial court, considered and only then work its way through the system. I know that. You know that. But people targetted by this tomfoolery don't, and in the process, get their stories mined by a paid anti-abortion speaker. I submitted a form and checked the box for 'willing to share.' I have never had an abortion. If I am chosen it'll be an educational experience...for them on how self-reports aren't exactly a reliable source of data, especially when you cannot verify them. I know it's terrible to do...but quite honestly, I am sick of them lying. And if I ever see my 'story,' I will out them. It'll be a great learning experience for all. A third breakaway group, Silent No S'mores, is planning a big bonfire on the hill this summer. Bring your own marshmallows. :) That sounds like fun.